The Women’s Association of Georgia, USA (GWAG-USA) in partnership with Rotary Clubs of Airport and Airport City in Accra, has donated equipment and supplies to maternity wards of five hospitals around the country. Representatives of the beneficiary heath facilities — Adaklu Polyclinic, Ho Central Polyclinic, Oda Government Hospital, Ho West Polyclinic and Elmina Urban Healthcare Centre —took delivery of the donated supplies in a short ceremony. She explained that most of the circumstances women face during pregnancy are beyond the control of the organisation but expressed the hope that with excellent care, access to great healthcare facilities, there would be positive outcome. “We would rather help the unborn baby have a fighting chance to live, we would rather help an expectant mother have her own bed than share a bed with another, we would rather not have a woman in labor lie on the floor waiting her turn to deliver her baby, we would rather expectant mothers have the prenatal and antenatal care they need, than to watch them turned away to go and have babies at home,” Madam Harruna said. She also expressed thanks to the then Rotary Presidents Yoku Korsah and Cathy Ekar, who led their clubs to take charge of a lot of the logistical support once the items arrived in Ghana and worked with the coordinator (Hajia Fatima) to ensure the smooth distribution of all the items. 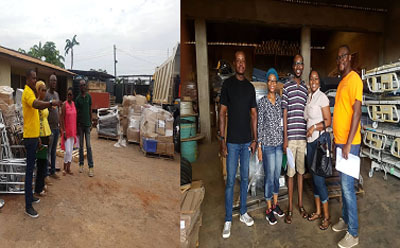 “Special thanks go to Assistant Governor Dave Amankwah who gave us his warehouse to use as the storage and distribution centre,” she pointed out. GWAG-USA was formed based on a common interest of a few women whose passion for positive change within the community far supersedes the basic idea of an improved lifestyle. With their growing passion and bigger vision, GWAG today boasts of 40 and more active members.